"Form of Seal of the General Assembly as Recommended by the Committee," 1891. In conducting its research, the committee had discovered a seal it believed to have been adopted by the Trustees of the General Assembly as early as 1799. Featuring a serpent on a cross in a bare landscape, the predecessor seal served as the basis for the design offered up to the 1891 assembly—a design the committee embellished with a rising sun symbolizing Christ, olive and oak leaves symbolizing peace and strength, and palm leaves referencing the seal of the Westminster Assembly. 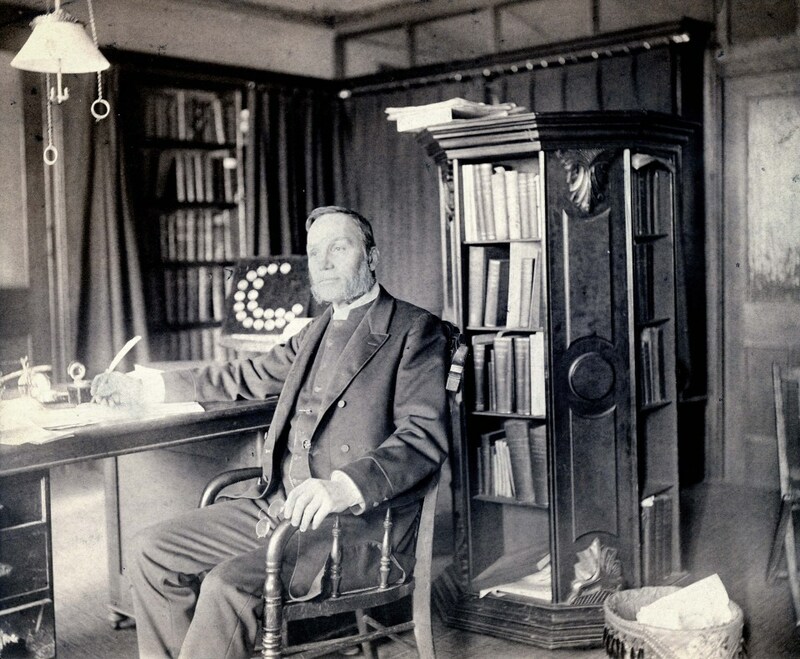 Henry C. McCook, ardent snake advocate. Much of the committee’s report argues the merits of the snake-draped cross, which “has been the occasion of some misunderstanding and unfriendly criticism.” If the committee members thought such an erudite document would preempt further criticism, they were sorely mistaken. A newspaper headline describing the discussion sums it up well: “The Seal Question a Lively Issue – No Quarter for Snakes.” The serpent on the cross was objected to because it was “repulsive, heathenish, obscure, needing an archaeological professor to explain it, and also because it’s unscriptural.” Various anti-snake assembly speakers argued that, beyond the serpent’s obvious associations with Satan in the Bible, people’s instinctive dislike for the breed meant that women and children would recoil upon seeing the proposed seal. Sentiment seemed to be running strongly against the reptile. "The Serpent on the Cross. 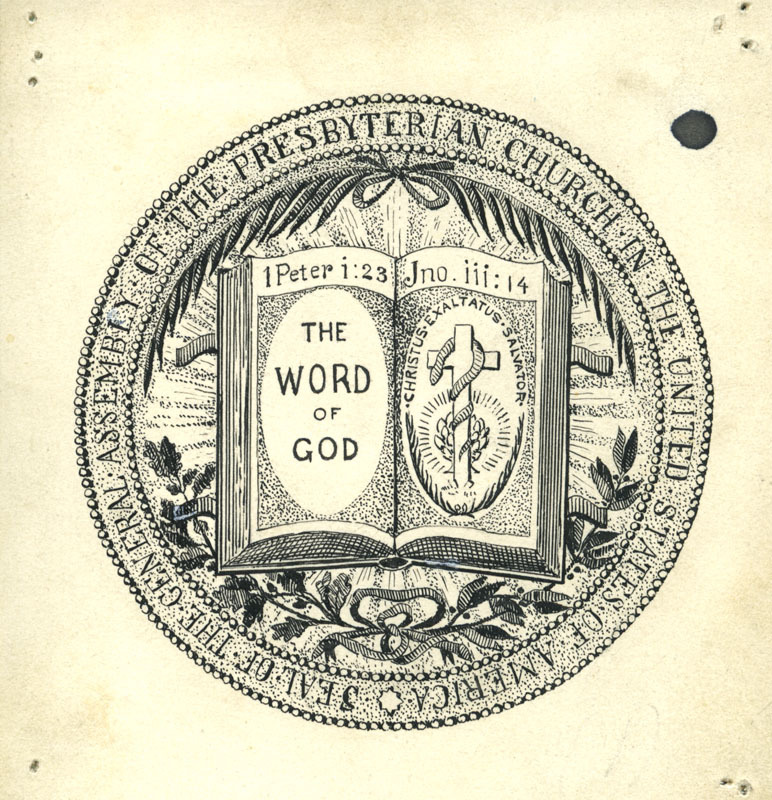 A Report Upon the Seal of the Presbyterian Church in the United States. [(U.S.A.)]” Presented to the General Assembly at Its Session in Detroit, 1891. Philadelphia: Allen, Lane & Scott, Printers, 1891, p. 9., Accession # 91 1121. Newspaper clipping, 103rd General Assembly in Detroit scrapbook (1891), Elizabeth Vara McMurray Ellyson papers, Accession # 00 0914a.